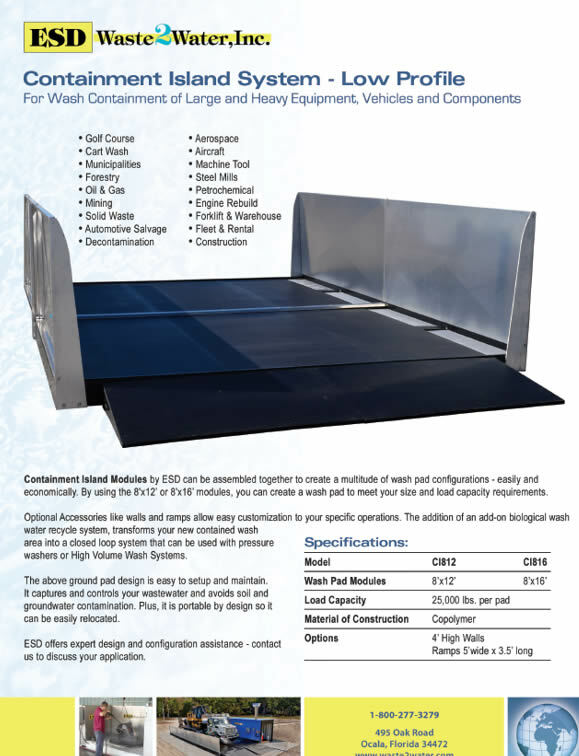 For wash operations that require mobility, unobtrusive installation, minimal, or no permitting, or all of these, ESD manufactures a full line of portable wash racks. 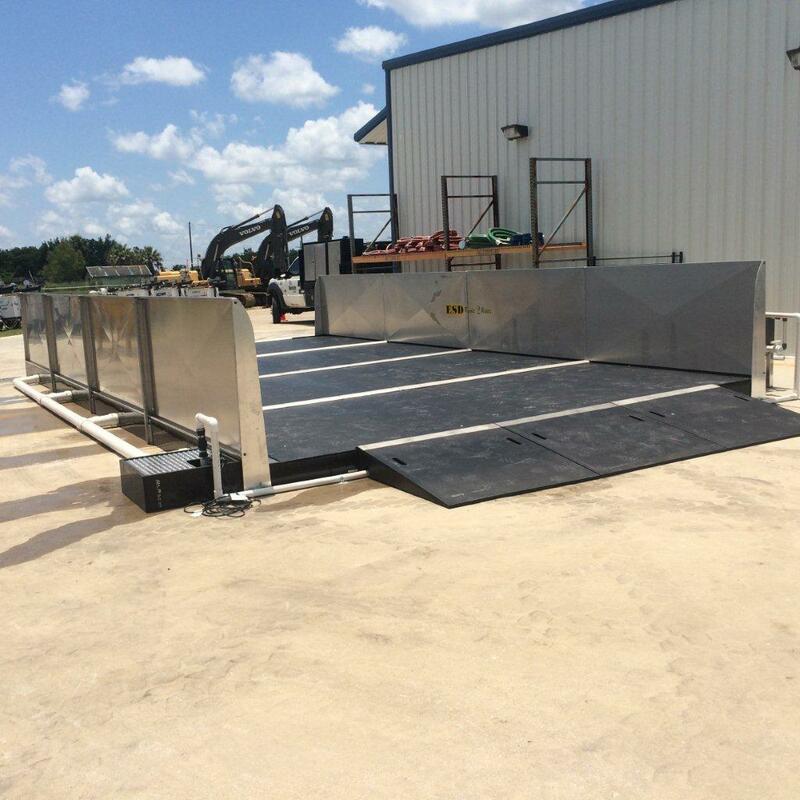 They’re Customizable: You can assemble our containment island modules to your own specific needs to meet the size and load capacity of your specific applications, with optional accessories such as ramps and walls to further customize the rack. These above ground units are easily customizable to fit your equipment washing needs. They Typically Require No Permit: Whether you’re using your portable wash rack as an equipment wash rack, a car wash rack, a parts wash rack or for some other purpose, we’ve designed our wash rack systems so you can use them just about anywhere without a permit. They’re Mobile: Our wash racks are specifically designed to be portable, so you can take them from location to location to wash whatever you need whenever you need to. They Conserve Water: The biological wash water recycle system keeps your water in a loop, therefore conserving water. They Comply With EPA Regulations: Our design controls wastewater and keeps it out of the groundwater system, making it sure to satisfy the EPA. They Protect Your Property From Contaminated Wash Water: That same system protects you from contaminating your own groundwater. Whether you need a small parts washing system or a large portable wash rack, ESD can design and build a system to meet your specific washing and mobility needs. Portable wash racks can be combined with wash water recycle systems, water cannons, and pressure washers to create a mobile closed-loop wash operation. The wash equipment can be contained in a customized heated/air-conditioned portable ISO container for complete and easy mobility. Our solutions are customized to your specific requirements. Our heavy duty wash racks can be used with cars, trucks, military vehicles and even heavy equipment. Our portable wash racks are the most convenient, economical and environmentally-friendly portable wash stations you’re likely to find. These flexible wash stations are suitable for everything from golf carts to aircraft to oil rig equipment, construction equipment and much more. With 8’x12’ and 8’x16’ sizes, a load capacity of 25,000 lbs. or more, per pad, tough copolymer construction and custom options such as 4’ high walls and 5’ x3.5’ ramps, you can quite easily customize your portable wash rack to meet the needs of your environment. They’re incredibly easy to set up either in-ground or above ground. Our wash systems are also suitable for high volume water cannons and pressure washers. Plus, they’re great at containing wastewater to protect your property and the greater environment around you. If you’ve been waiting for the perfect portable wash rack, you’ve found it at ESD Waste2Water. Give us a call at 855-383-7135 any time for help with design and configuration from our team of experts, or to place an order. We look forward to hearing from you! 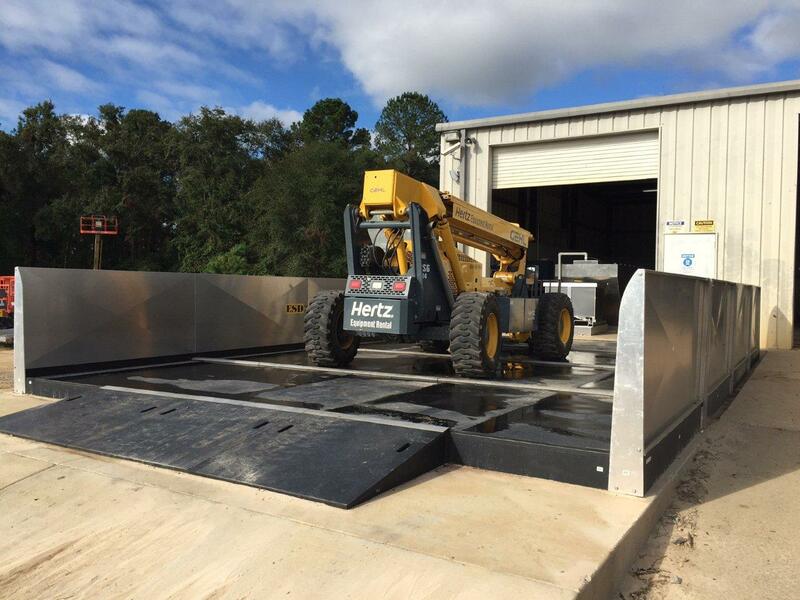 This rental yard in Georgia went with an ESD portable equipment washing rack due to the high cost of construction permitting and the availability of a quick ESD solution. 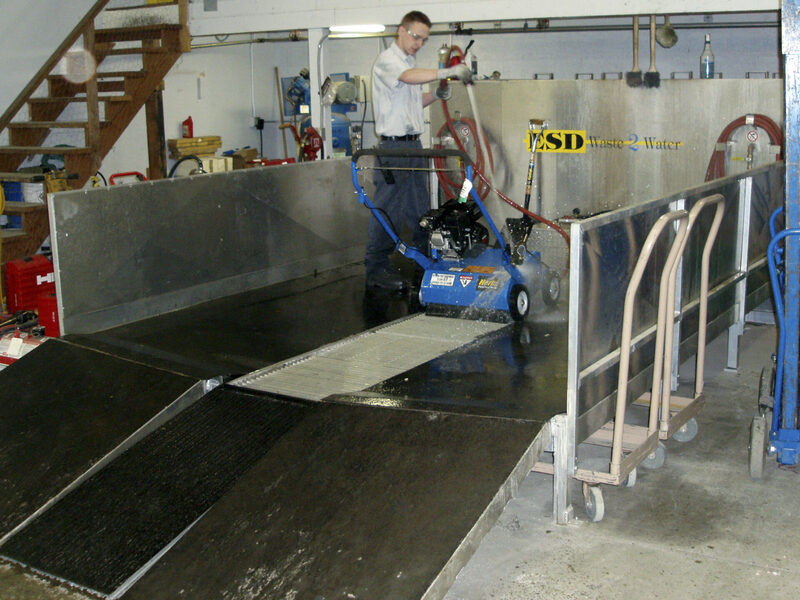 The ESD recycle system and standard pressure washer are located just inside the roll-up door at the end of the portable wash rack. Rental Yards are becoming increasingly aware of the fact that equipment wash water that is not contained will contaminate their property. ESD has the solutions to this problem with customized wash water recycle systems and wash racks that will help rental yards conserve wash water, comply with applicable regulations set by the EPA and protect their property from contaminated water from washing equipment. This rental yard in Everett, WA uses an ESD portable wash rack with a built-in wash water recycling system to wash small rental items with 100% recycled water. The portable wash system is small enough to easily fit inside a heated shop for year-round washing. Pictured above is a lawn mower being washed with 100% recycled water on our small equipment rack. If you are washing heavy equipment, some of your main objectives in designing an efficient and compliant wash rack would likely include be to save and conserve water, comply with EPA regulations, and protect your property from contaminated water from your wash operation. At ESD, we share your equipment wash rack goals and design, manufacture, install and service portable washing equipment that will help you meet your objectives. 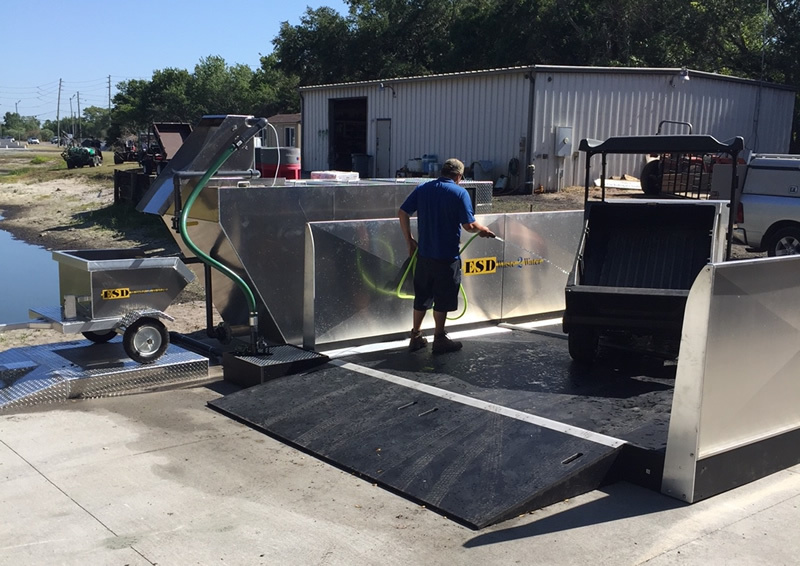 From powerful water cannons, to mud handling, to portable wash racks, to wash water recycle systems, we provide and service the equipment you need for an efficient and compliant wash rack for your heavy equipment washing needs. Contact an expert at ESD today for assistance with your next wash bay project. 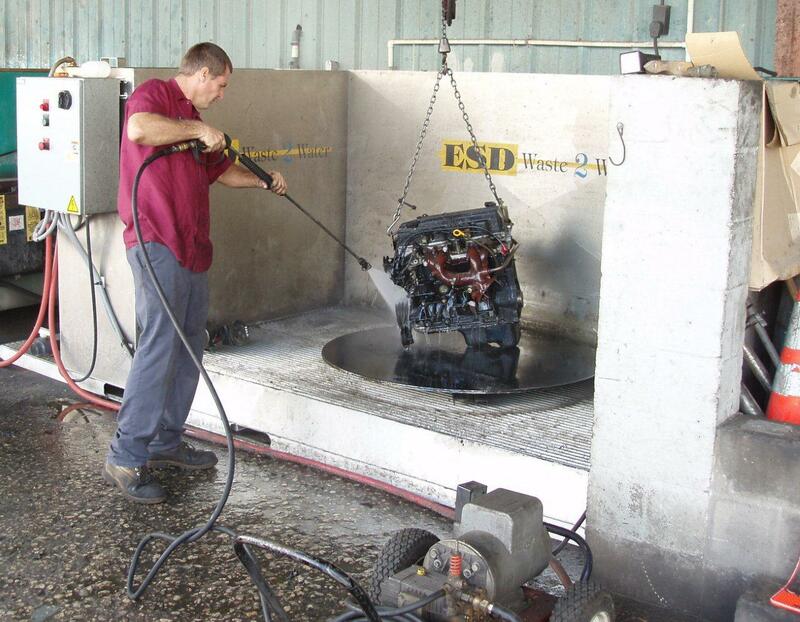 This Auto Recycler uses ESD’s Portable Wash Station (PWS) to clean engines, transmissions, brakes and hundreds of other auto and truck parts to get them ready to sell. The wash water is 100% recycled and there is a convenient turntable mounted on the wash platform for easy rotation during the washing process of engines and other large parts. In this picture, an engine is suspended from a hoist for easy pressure washing inside of our wash station. 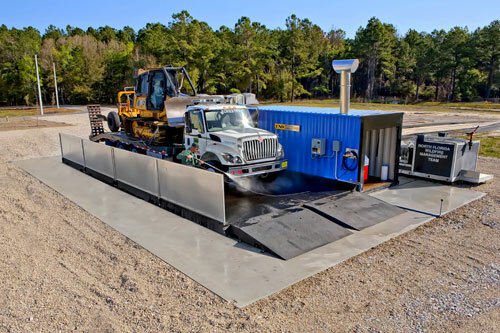 This portable wash system used by the Department of Forestry in Florida includes an ESD portable wash rack with an ESD portable enclosure that includes a pressure washer and a wash water recycle system. It is designed for quick set up and takedown for portable washing needs. The Dept. of Forestry washes a variety of outdoor equipment with this system. Pictured is our rack supporting the weight of a large truck with a bulldozer as they’re being washed down with 100% recycled water. This military wash and decontamination station provides the ultimate in portability. 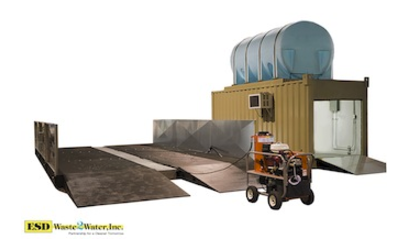 In addition to an ESD portable wash rack, recycle system, pressure washer and equipment container, it also has a water storage tank so it can be used in areas with limited water access. The water storage tank provides makeup water for the wash water recycle system due to evaporation and vehicle carry-off during the washing process. This unit is used to wash a variety of military vehicles in the Middle East.